As an independent creator on YouTube, I often see people re-uploading my content. They either re-upload the entire video or a part of it. Thankfully, YouTube allows to file copyright infringement complaint against such re-uploads. Recently, one such person with the username “glossomize” and channel named as “Tiago Gonçalves” re-uploaded my content. So I decided to take steps and file copyright infringement compliant. YouTube took action within two hours and the video was removed instantly. This guy copied entire audio of one of my videos and tried to make a funny video with the muppets. God knows why he did that? May be he did not have anything better to do. 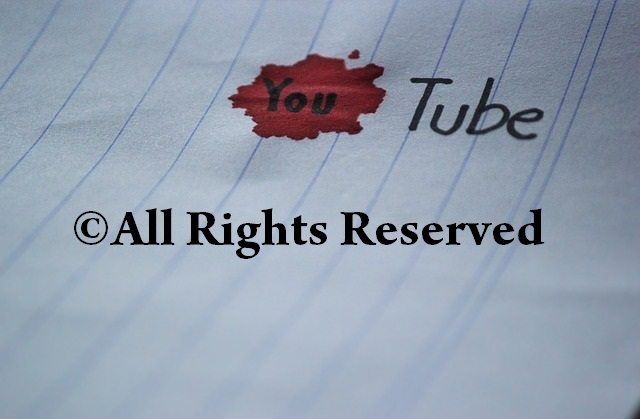 So here is a step-by-step guide on how to file copyright infringement complaint on YouTube. Step 1: Login into your YouTube account. Step 2: Open the video against which you want to file copyright infringement complaint. 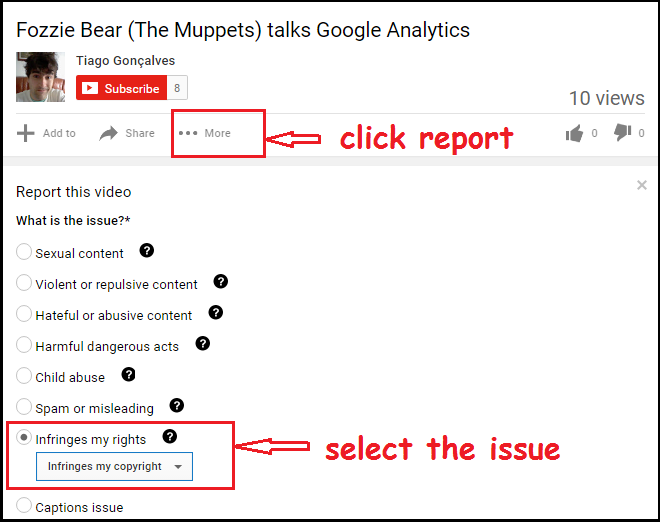 Step 3: Click on report from the more option below the video. Step 4: Select the issue as “infringes my copyright”. There are multiple option. So choose accordingly. In cases like this, select “infringes my copyright”. 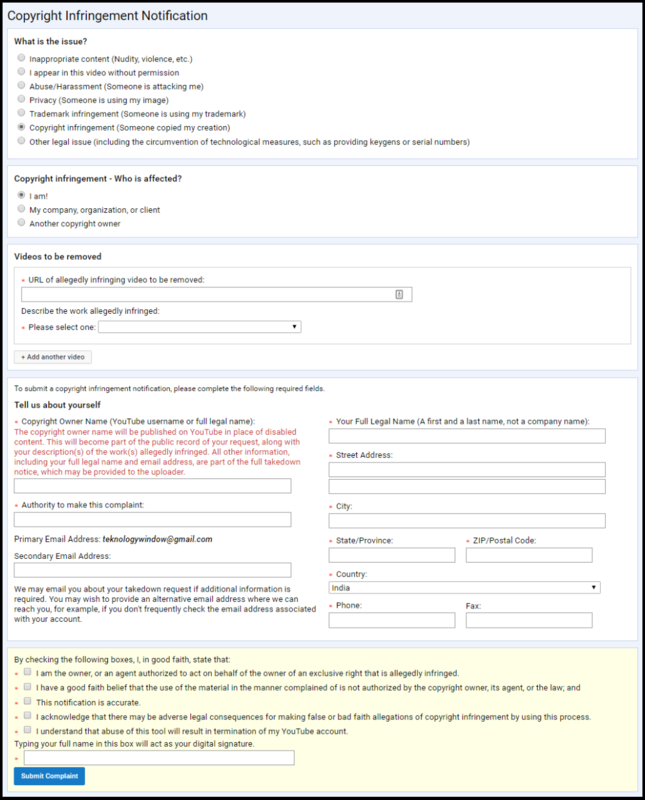 Step 5: Click on submit a copyright complaint. Step 6: Fill the form presented on the final page. In this page, you have to fill the details carefully. Mention the video that is to be removed. Provide the appropriate URL of both the videos. Enter the exact start time and end time between which your content is copied. Provide your proper street address, phone number, full name etc. Lastly, provide your consent by checking all the points mentioned at the end of the notification form. Once you submit the form, you will get an acknowledgement notification on your email. After your claim is passed, you will be notified via email that the video has been removed. Any false claim by the person who is complaining will also be not accepted. So make sure that you are filing complaint for your content only and not anybody else’s. False claim may result in termination of your own account. On the other hand, if your claim is passed then the video gets removed immediately. The other person gets a copyright strike on his/her channel. If he/she gets three copyright strikes then his/her account will be terminated. You can use this “report” option to file other complaints as shown in the image above. So the next time while browsing YouTube, if you come across any such content then use this option. Select the appropriate issue for your complaint. YouTube is shortly going to roll out the content ID system for any copyright dispute. However, the feature is not rolled out yet. In this dispute process, the claim will be on hold until YouTube decides the original content owner. The revenue will be paid to the owner after YouTube makes the final decision. Thus, it will give fair chance to the 3rd party. So this is how you can file a copyright infringement complaint on YouTube. Its simple and fast.